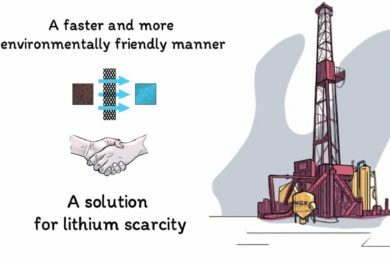 MGX Minerals has moved a step closer to its goal of extracting lithium from oil and gas wastewater with the announcement that its engineering partner has delivered the first treatment system to a facility north of Edmonton, Canada. The commercial-scale 750 bbl/d advanced wastewater treatment system, delivered by MGX’s engineering partner PurLucid Treatment Solutions, is currently in the final phase of electrical connection and will be in operation shortly, the company said. MGX and PurLucid expect to begin processing concentrated evaporator blowdown wastewater under an existing agreement with an oil sands steam assisted gravity drainage (SAGD) operator in early November. Shortly after, they expect to start processing additional wastewater containing lithium from a second oil sands SAGD operator. MGX’s rapid lithium extraction technology eliminates or greatly reduces the physical footprint and investment in large, multi-phase, lake-sized, lined evaporation ponds, as well as enhances the quality of extraction and recovery across a complex range of brines as compared with traditional solar evaporation, the company says. It is applicable to petrolithium (oil and gas wastewater), natural brine, and other brine sources such as a lithium-rich mine and industrial plant wastewater. Back in August, after a number of successful pilot test results, the company signed up Hatch to advise it on the scaling up of its technology in the western US. PurLucid’s exclusively licensed and patented nanoflotation technology, meanwhile, is designed specifically for oil field environments, separating impurities from oil and gas wastewater and producing clean water as a final product. The brines from the SAGD operations will be processed for lithium recovery, wastewater purification and disposal of residuals, MGX said. The delivery of this latest system has been aided by government funding. PurLucid was awarded a non-repayable contribution totalling up to C$8.2 million ($6.3 million) in government funding to support the commercialisation of a low energy water treatment system for the oil and gas industry. This has enabled the company to develop the commercial-scale system now on site in Canada and also bring a second 1,500 bbl/d system to “near completion” at PurLucid’s manufacturing facility in Calgary, Alberta, according to MGX. This second facility is expected to be deployed in approximately 60 days with additional wastewater and mineral extraction systems to rapidly follow throughout 2019-2020, MGX said.